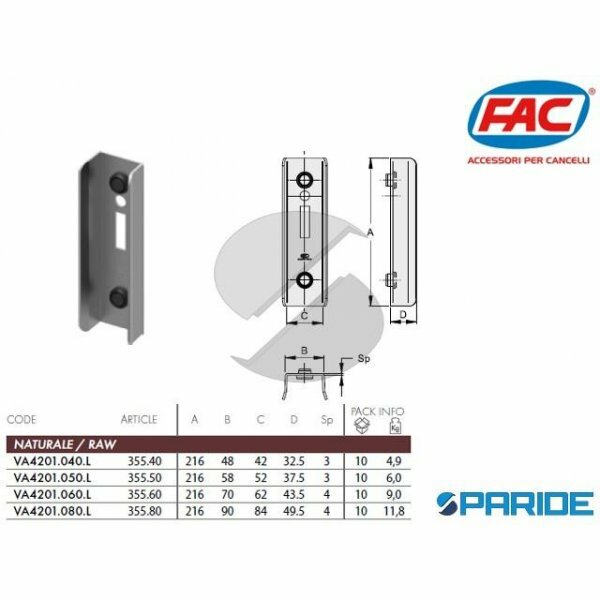 BATTENTE APERTO PER SERRATURA A GANCIO 35560 FAC VA4201060L. BATTENTE APERTO PER SERRATURA A GANCIO, ARTICOLO 355.60 FAC, PER CANCELLI SCORREVOLI, ALTEZZA 216 MM, LARGHEZZA BATTENT..
BATTENTE DI ARRESTO A TERRA 115 FAC VA4101092. BATTENTE DI ARRESTO E DI SICUREZZA A TERRA, ARTICOLO 115 FAC, PER CANCELLI, ALTEZZA ARRESTO 92 MM, LARGHEZZA 50 MM, MISURE TAMPONE (C..
INCONTRO SUPERIORE 50S REGOLABILE PER CANCELLI ROLLING CENTER. INCONTRO SUPERIORE 50S PER CANCELLI SCORREVOLI REGOLABILE ROLLING CENTER, LUNGHEZZA 115 MM, ALTEZZA 55 MM, LARGHEZZA ..
PIASTRA 2RGZ CON RULLI GUIDA DA TASSELLARE A MURO ROLLING CENTER. PIASTRA 2RGZ PER CANCELLI CON RULLI GUIDA REGOLABILI DA TASSELLARE A MURO, LUNGHEZZA 203 MM, ALTEZZA PIASTRA LATO ..
PIASTRA 4RG CON RULLI GUIDA GRANDE PER CANCELLO ROLLING CENTER. PIASTRA 4RG IN CONFORMITA ALLA UNI EN ISO 13857 CON RULLI GUIDA GRANDE PER CANCELLO, LUNGHEZZE L 195X245, LUNGHEZZA ..
PIASTRA 4RGP CON RULLI GUIDA GRANDE PER CANCELLO ROLLING CENTER. PIASTRA 4RGP IN CONFORMITA ALLA UNI EN ISO 13857 CON RULLI GUIDA GRANDE PER CANCELLO, LUNGHEZZE L 195X245, LUNGHEZZ..
PIASTRA 4RGR GUIDA GRANDE 4 RULLI REGOLABILI ZINCATA BIANCA ROLLING CENTER. PIASTRA 4RGR PER CANCELLI CON 4 RULLI REGOLABILI, ZINCATA BIANCA, GUIDA GRANDE. LUNGHEZZA L 230 MM, LUNG..
PIASTRA 4RGRP GUIDA GRANDE 4 RULLI REGOLABILI ZINCATA BIANCA ROLLING CENTER. PIASTRA 4RGRP PER CANCELLI CON 4 RULLI REGOLABILI, ZINCATA BIANCA, GUIDA MEDIA. LUNGHEZZA L 230 MM, LUN..
PIASTRA 4RM CON RULLI GUIDA MEDIA PER CANCELLO ROLLING CENTER. 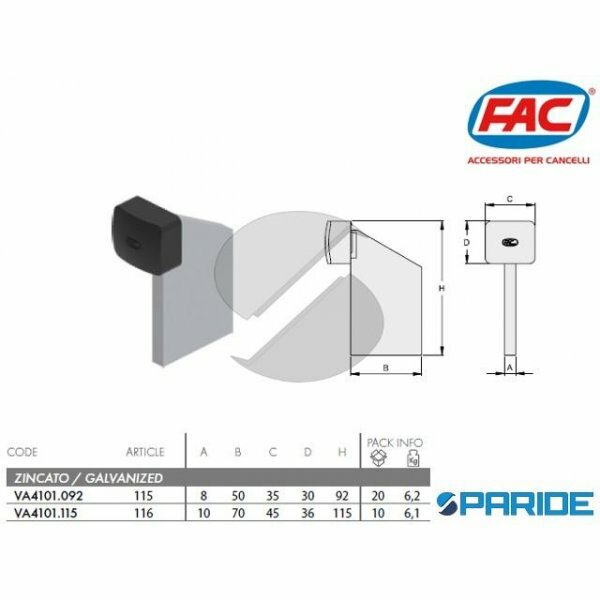 PIASTRA 4RM IN CONFORMITA ALLA UNI EN ISO 13857 CON RULLI GUIDA MEDIA PER CANCELLO, LUNGHEZZE L 120X160, LUNGHEZZA H ..
PIASTRA 4RMP CON RULLI GUIDA MEDIA PER CANCELLO ROLLING CENTER. PIASTRA 4 RMP IN CONFORMITA ALLA UNI EN ISO 13857 CON RULLI GUIDA MEDIA PER CANCELLO, LUNGHEZZE L 120X160, LUNGHEZZA..
PIASTRA 4RMR GUIDA MEDIA 4 RULLI REGOLABILI ZINCATA BIANCA ROLLING CENTER. PIASTRA 4RMR PER CANCELLI CON 4 RULLI REGOLABILI, ZINCATA BIANCA, GUIDA MEDIA. LUNGHEZZA L 175 MM, LUNGHE..
PIASTRA 4RMRP GUIDA MEDIA 4 RULLI REGOLABILI ZINCATA BIANCA ROLLING CENTER. PIASTRA 4RMRP PER CANCELLI CON 4 RULLI REGOLABILI, ZINCATA BIANCA, GUIDA MEDIA. LUNGHEZZA L 175 MM, LUNG..
PIASTRA CON RULLI IN LINEA 2 RGG Z REGOLABILE PER GUIDA CANCELLI SCORREVOLE ROLLING CENTER. 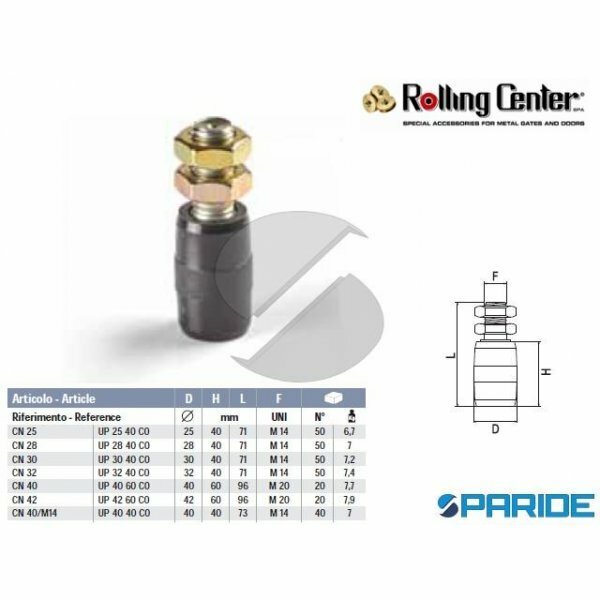 PIASTRA PER CANCELLI SCORREVOLI REGOLABILE, ARTICOLO ROLLING CENTER 2 RGG Z REGOLABILE, ..
PIASTRA CON RULLI 2RP GUIDA PICCOLA PER CANCELLO ROLLING CENTER. PIASTRA CON RULLI GUIDA PICCOLA 2RP IN CONFORMITA ALLA UNI EN ISO 13857 PER CANCELLO ROLLING CENTER. 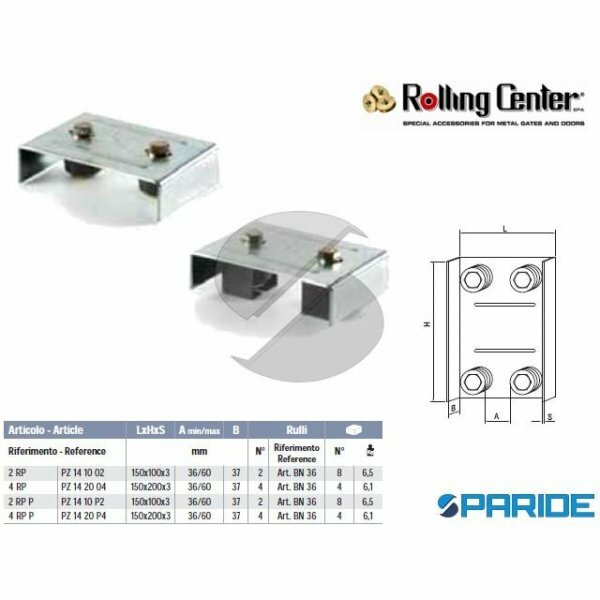 LUNGHEZZE PIAS..
PIASTRA CON RULLI 2RPP GUIDA PICCOLA PER CANCELLO ROLLING CENTER. PIASTRA CON RULLI GUIDA PICCOLA 2RPP IN CONFORMITA ALLA UNI EN ISO 13857 PER CANCELLO ROLLING CENTER. 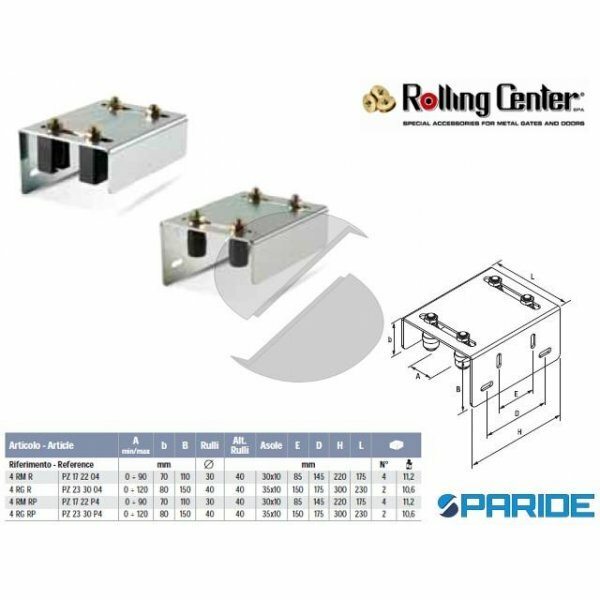 LUNGHEZZE PI..
PIASTRA CON RULLI 4RP GUIDA PICCOLA PER CANCELLO ROLLING CENTER. PIASTRA CON RULLI GUIDA PICCOLA 4RP IN CONFORMITA ALLA UNI EN ISO 13857 PER CANCELLO ROLLING CENTER. 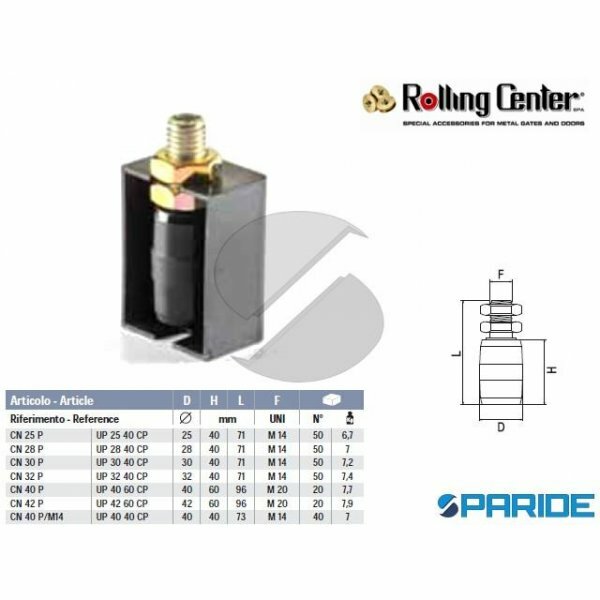 LUNGHEZZE PIAS..
PIASTRA CON RULLI 4RPP GUIDA PICCOLA PER CANCELLO ROLLING CENTER. PIASTRA CON RULLI GUIDA PICCOLA 4RPP IN CONFORMITA ALLA UNI EN ISO 13857 PER CANCELLO ROLLING CENTER. LUNGHEZZE PI..
PIASTRA GUIDA 345 INFERIORE CON OLIVA OTTONE. 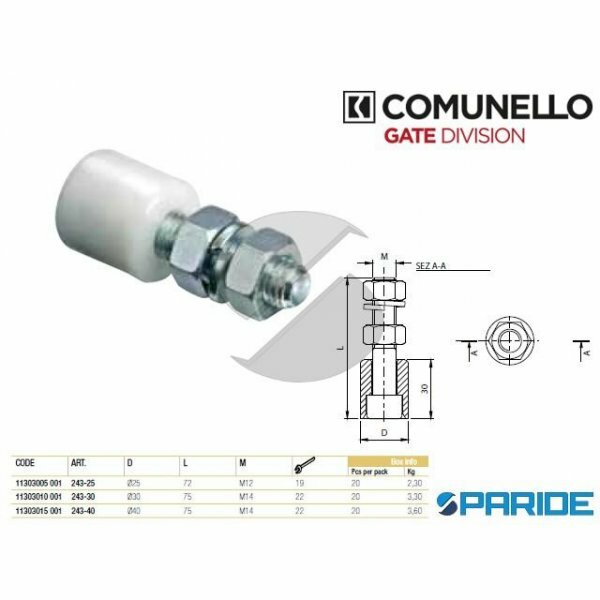 PIASTRA GUIDA 345, INFERIORE, CON RULLO OTTONE, PER PORTE SCORREVOLI, CON 4 FORI, LUNGHEZZA PIASTRA 110 MM, SPESSORE 8 MM, DIAMETRO OL..
RULLO GUIDA 243-30 IN NYLON D 30 MM COMUNELLO. RULLO GUIDA IN NYLON, ARTICOLO 243-30, DIAMETRO 30 MM, PERNO M14, PER CANCELLI SCORREVOLI IN FERRO. 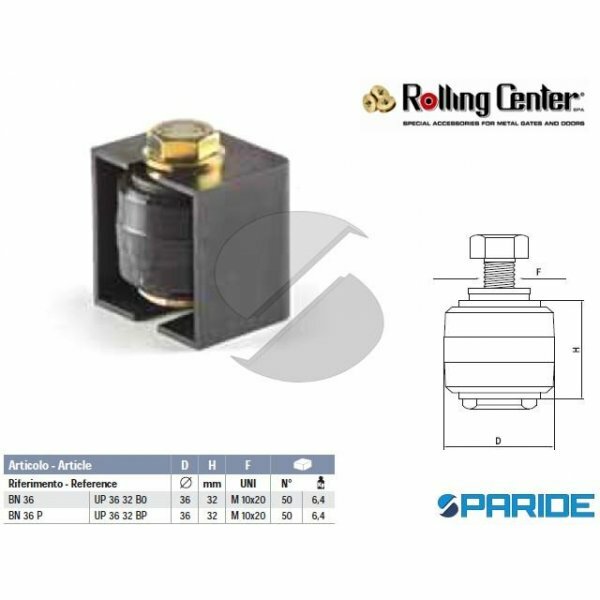 CODICE RULLO GUIDA IN NYLON D 30 ..
RULLO GUIDA BN36 IN NYLON BOMBATO ROLLING CENTER. 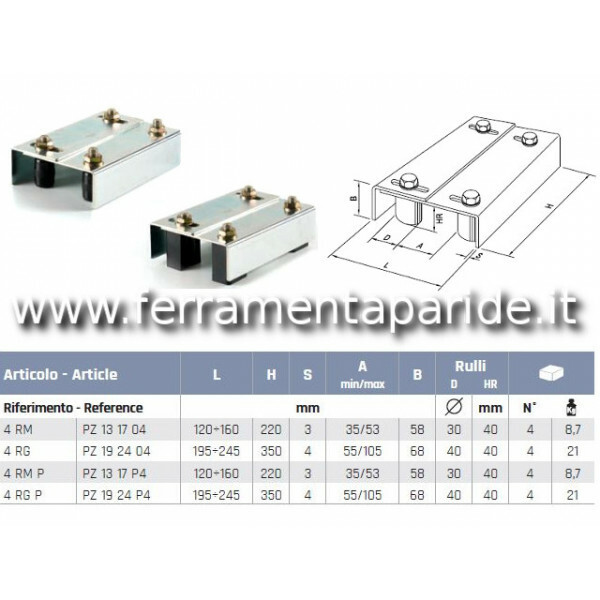 RULLO GUIDA BN36 PER PIASTRE, PER CANCELLI, IN NYLON BOMBATO, DIAMETRO RULLO 36 MM, ALTEZZA H 32 MM, FILETTO UNI M 10X20. 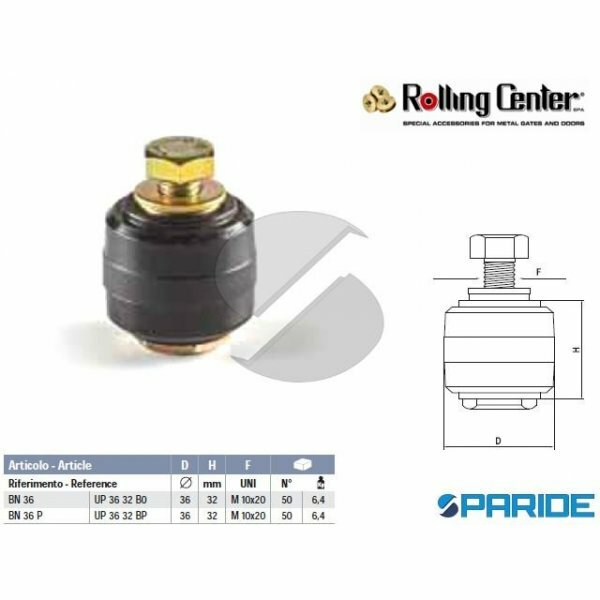 CODICE R..
RULLO GUIDA BN36P IN NYLON BOMBATO ROLLING CENTER. 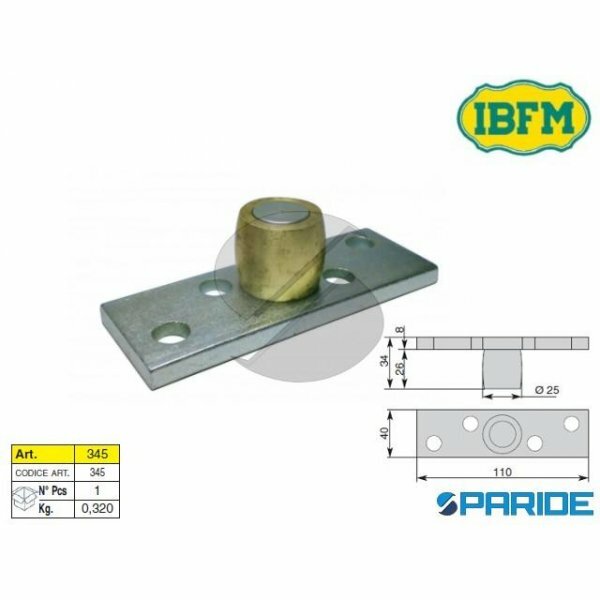 RULLO GUIDA BN3P6 PER PIASTRE, PER CANCELLI, IN NYLON BOMBATO, DIAMETRO RULLO 36 MM, ALTEZZA H 32 MM, FILETTO UNI M 10X20. 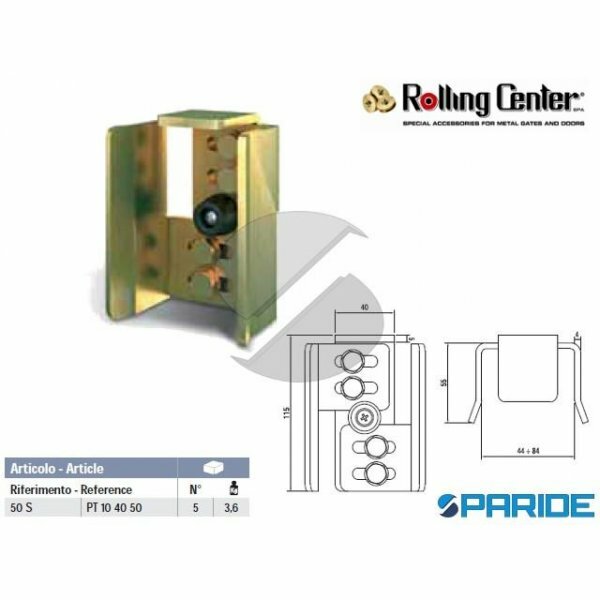 CODICE..
RULLO GUIDA CN25 IN NYLON CILINDRICO ROLLING CENTER. 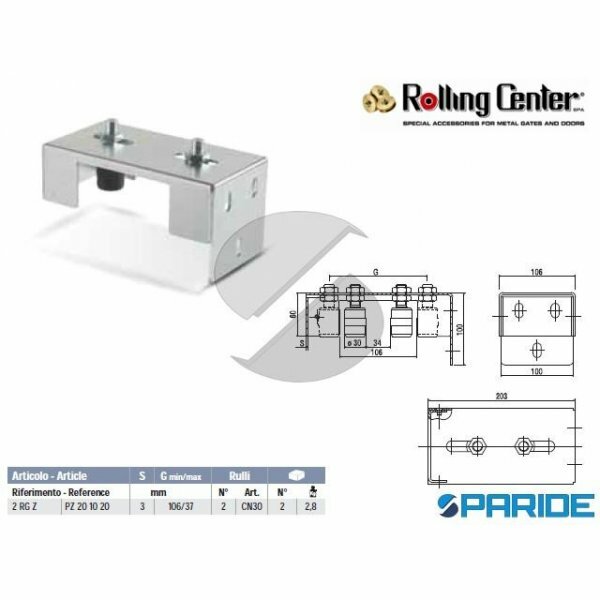 RULLO GUIDA CN25 PER PIASTRE, PER CANCELLI, IN NYLON, CILINDRICO ROLLING CENTER, DIAMETRO RULLO 25 MM, ALTEZZA RULLO 40 MM, LUN..
RULLO GUIDA CN25I INOX IN NYLON CILINDRICO ROLLING CENTER. 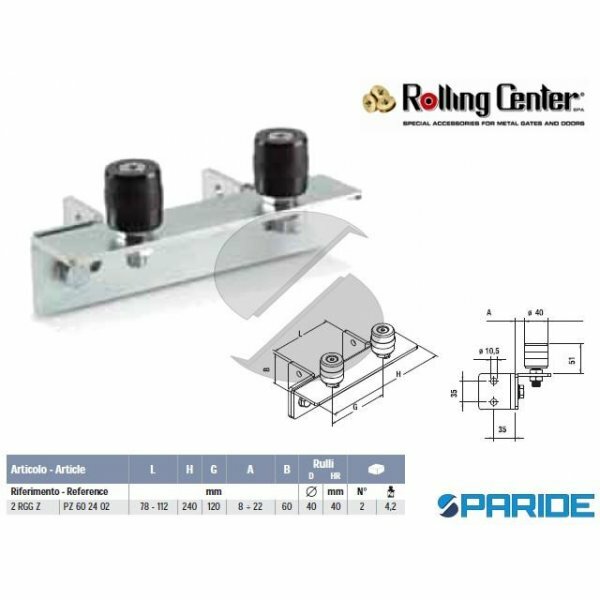 RULLO GUIDA CN25I PER PIASTRE, PER CANCELLI, IN NYLON, PERNO IN ACCIAIO INOX, CILINDRICO ROLLING CENTER, DIAMETRO RULLO 2..
RULLO GUIDA CN25P IN NYLON CILINDRICO ROLLING CENTER. RULLO GUIDA CN25P PER PIASTRE, PER CANCELLI, IN NYLON, CILINDRICO ROLLING CENTER, DIAMETRO RULLO 25 MM, ALTEZZA RULLO 40 MM, L..